It's been about 5 weeks since my last post. I can't believe it's been that long. 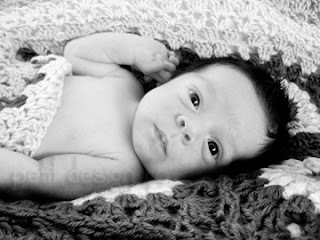 Things around the Petit Design household have gotten a little more hectic, a lot more lax, and a lot more cuddly. My little guy was born a month ago and already I cannot imagine life with out him. OK so maybe I can imagine a lot more sleep! I'm pretty much recovered from my c-section, it's the nursing that's killing me. This little guy is a voracious empty pit with a very strong sucking instinct. This makes for one very sore mama, plus I think I have now developed thrush. :( *boo, hiss, spit* That plus lack of sleep = no sewing whatsoever. Come to think of it, it really = not much of anything is getting done around here! I have been working on some new items for my shop though. I've started a new line of Applique Templates. These are just that, a template for applique (or scrapbook paper piecing, embroidery, crafting etc.) You can us them on quilts, t-shirts, aprons, etc. It does not contain any instructions on how to do applique (there are many applique tutorials on the web.) To give you an idea of what my templates are like I thought I would share a free applique template with you all. It's still a very hot summer in the south so we're still enjoying popsicles. You can enjoy some too even if summer has left your part of the world! 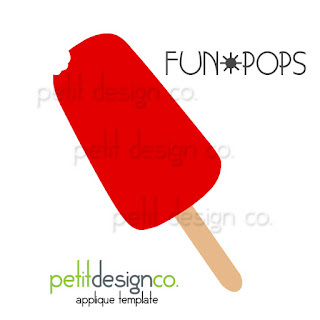 Share your creations over at the Petit Design Co. Flickr pool. I love to see what you make. Have a great Labor Day weekend, and enjoy some popsicles. PS I hate the banana flavored ones, YUCK. Oh, what a sweet little boy! And all that hair!! Just so kissable.